When you are looking for a hybrid crossover sport utility vehicle, one of the first things you need to think about is what it has to offer on the interior. The Toyota RAV4 is one of the most popular cars in this class in no small part because of what it has to offer inside. One thing that gives the Toyota RAV4 an edge over others in its class is its heated, power-adjustable seats that give you both warmth, comfort, and control. Another useful interior feature is Siri® Eyes Free, which you can use to control the car by voice with an iPhone. 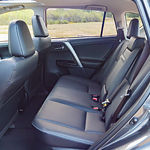 Would you like to see the Toyota RAV4 for yourself so you can take it for a test drive? Visit our showroom at Mann Toyota in Prestonburg as soon as you can; a member of our sales team will be more than happy to show it to you.